New Benriach Malts From Edencrofts! Edencrofts has a feast of five Benriach malts to delight us with this week – the ages of these Speyside whiskies ranging from 24 to 34 Years Old. Nose: Vanilla-dusted sweet fruits, melon and pineapple combined with gentle soft oak. Taste: Candied fruits mingle with soft vanilla and cinnamon. A honeyed oak note holds the elegant barley sugar finish. FOR DISCERNING INDIVIDUALS:It’s not often a long kept secret is revealed in the world of Single Malt Scotch Whisky – but here is a true discovery! Since 1898, the BenRiach distillery has very quietly been producing quality Single Malt Scotch Whisky, which has only ever been enjoyed in very small quantities, by a few discerning individuals who have been fortunate enough to come across a bottle. Today, BenRiach continues to produce its very special Single Malt Whiskies, as an Independent Distiller. UNIQUE AMONGST MANY:The BenRiach Distillery is located in the ‘Heart of Speyside’, between the village of Rothes and the town of Elgin, in the North-East of Scotland. The Spey Valley, in which the BenRiach Distillery was built by John Duff in 1898, is home to many of Scotland’s great whiskies, but BenRiach has its own uniqueness borne from the particular methods and skills of the men who craft the whisky, the ingredients they use, the distinctive copper stills and high quality barrels selected for maturation. “I am often asked what makes BenRiach special. There is no one thing, but the starting point has to be reputation and legacy. Then you must take the astonishing skills of the men who craft the whisky, the ingredients we use, the copper stills, the high-quality casks, our rich and varied inventory and our broad range of peated and non-peated expressions. To these you must add independence, enthusiasm, creativity and a real passion for whisky craftsmanship. As a result you get what I call a “heavenly explosion” – a sensational, unique, complex tour de force. Summary: Cask Type: Tawny Port Hogshead. Nose: Red berries and hints of ginger mingle with gentle honey, vanilla and cracked peppercorn. Taste: A mixed fruit jam holds allspice and a touch of coconut. A creamy port balances with crisp sweet oak in the finish. Colour: Rich amber with distinctive tawny highlights and a cherry wood core. Nose: A wave of stewed plums, damsons and sweet sultanas, interwoven with fine leather and well toasted oak. Taste: Spiced fruit shortcake on a bed of crushed grapes leading to an intense sherried finish. Firm tannins with impressive weight and length. Summary: Cask Type: Rioja Barrel. Nose: Toffee, sultanas and waves of spices and nuts. Taste: Lashings of raisins and sultanas, dancing with spices, pineapples and cedar wood. Summary: The Hunter Laing Sovereign Single Grain bottlings are increasingly becoming firm favourites with Whisky enthusiasts around the globe. Hunter Laing select only the finest casks which have been lying untouched in cold, dark and damp Scottish warehouses for many decades. Typically their aged Single Grain whiskies have a deliciously sweet and distinctly fruity character as a result of many years in the finest oak casks during maturation. Nose: Sweet powdery vanilla rich fruits with light floral notes combined with toffee to give smooth balanced nose. Palate: These rich fruity caramel flavours intensify on the palate to give a creamy bodied taste with dark chocolate highlights. Finish: long lingering pleasant aftertaste of toffee and a wisp of oak wood delights. New Auchentoshan Malts From Whisky Online! Summary: Lowland Single Malt Scotch Whisky Distillery Bottling 70cl / 40% The 12 year old has long been one of the best in the core Auchentoshan range richer and more satisfying than the classic but less serious and more playful than the 21 year old this is one of the best easy drinking every day drams out there. Summary: Lowland Single Malt Scotch Whisky Distillery Bottling 3 x 20cl Auchentoshan Ultimate Gift Pack the pride of Lowlands with the sweet aromas of vanilla and coconut a truly unique selection of 20cl bottles is the perfect gift for whisky lovers everywhere. 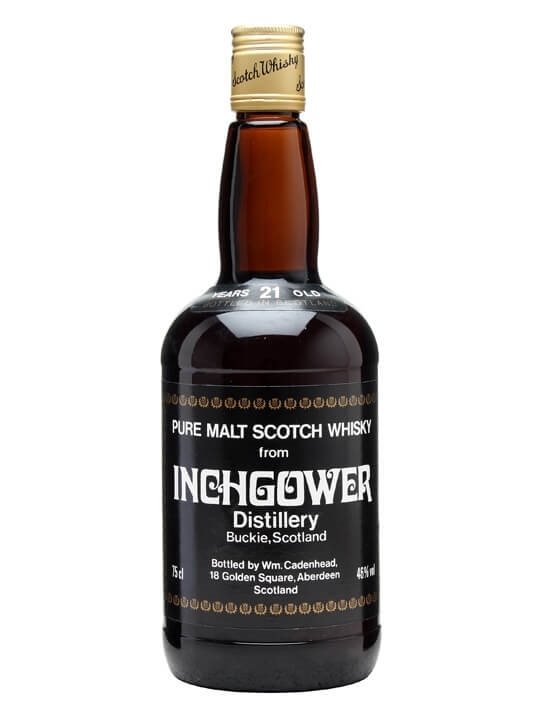 75cl / 46% / Cadenhead’s – A dumpy bottle of 21 year old Inchgower bottled in the 1980s by Cadenhead’s.